Money has been finding its way into the cosplay community for years now, but usually it’s been in the form of sponsorships or paid appearances, not—as Arby’s has just done—directly joining in on the fun. 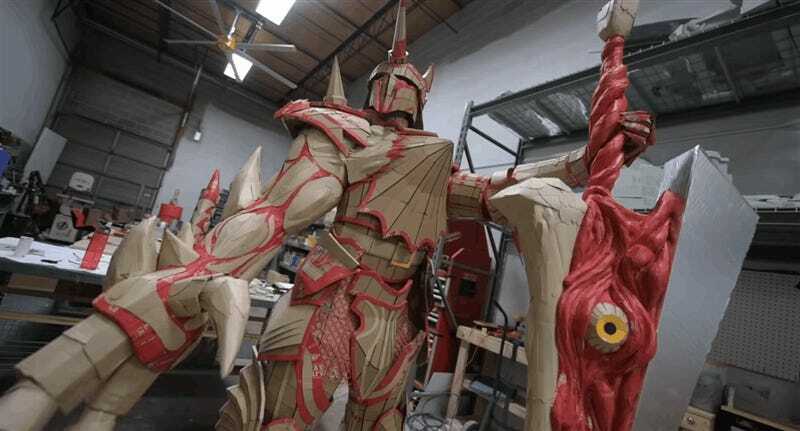 The company—which specialises in fast food and nerd jokes on Twitter—worked with cosplay costume and props builder Volpin Props to construct a Nightmare statue from Soulcalibur that stood a very impressive 7’8”. With the goal of showing it off at Anime Expo, the catch was that the outfit was made almost entirely out of Arby’s packaging. I can already sense the comments in response to this: that this is gross, that cosplay is an amateur hobby and that The Brands have no business here. To which I’d reply: The Money is already in cosplay, and it will only get worse, so the best you can hope for is when A Brand at least understands enough to work with an established community star.